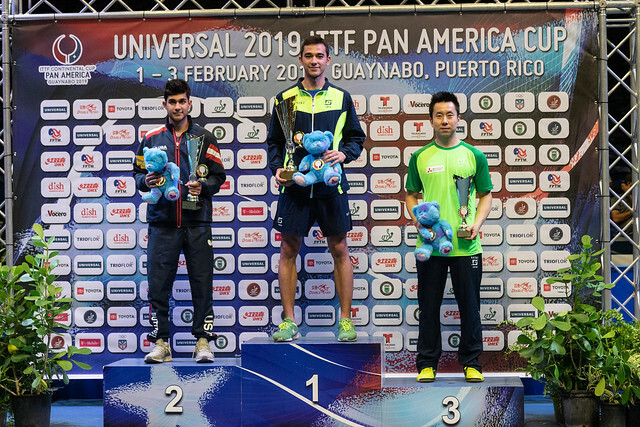 One of the largest insurance groups in the Caribbean region, Universal becomes the first ever title sponsor of the ITTF Pan America Cup, to be held 1-3 February 2019 in Guaynabo City, Puerto Rico. Adriana Diaz, native to Puerto Rico, is very much the face of the Universal 2019 ITTF Pan America Cup. The International Table Tennis Federation (ITTF) and the Puerto Rico Table Tennis Federation (FPRTM) are proud to announce that Universal has been named title sponsor of the 2019 ITTF Pan America Cup. One of the largest insurance groups in the Caribbean region, Universal becomes the first ever title sponsor of the prestigious event which will be held between 1-3 February fittingly in Guaynabo City, Puerto Rico. Set to showcase the very best table tennis talent from across the Pan America region – not least native stars, Adriana Diaz and Brian Afanador, the Pan America Cup has now received a significant boost off the court as well thanks to this agreement with Universal, helping to take the event to a new level commercially. “For Puerto Rican table tennis, the Universal 2019 Pan America Cup represents a dream come true. We will be putting on a professional, international event at a world-class venue in what will be a true celebration of the sport for our fans and players. This all represents a first for our sport in our country, and we’re very excited. “Our commitment to support Puerto Rican youth players develop their skills and capabilities to the fullest leads us to sponsor events like this. In addition to allowing us to enjoy table tennis of the highest quality, it gives us the opportunity to support the effort and dedication of this new generation of Olympic-calibre athletes as a symbol of quality that has always highlighted what we do in Puerto Rico. Monique Miranda, President of the Board of Directors of Universal Group Inc. This will be the 3rd edition of the Pan America Cup and the biggest yet following its inaugural showing in San Jose, Costa Rica, and last year’s event in Asuncion, Paraguay. Hugo Calderano (BRA) and Zhang Mo (CAN) are the defending men’s and women’s champions respectively and will be looking to retain their titles amidst stiff competition, not least from the aforementioned Puerto Rican representatives, Adriana Diaz and Brian Afanador. This will be the first time since 2016 that the pair participate in an international event on home soil. So far, more than 1,500 tickets have been sold for the three-day event in Guaynabo City. Make sure you don’t miss the region’s biggest stars battle it out for glory between 1-3 February and get your ticket right here! Universal Group Inc. is one of the largest insurance groups in the Caribbean region. It is a Puerto Rican company with operations in 17 states of the United States of America and offers insurance products, policy financing and investment options.